This is an elegant and show-stopping first course. You can certainly make fresh pasta for this recipe, but using wonton wrappers instead is an easier alternative. Because there are a series of steps in making the ravioli, I usually make a large batch and then freeze them for later use. 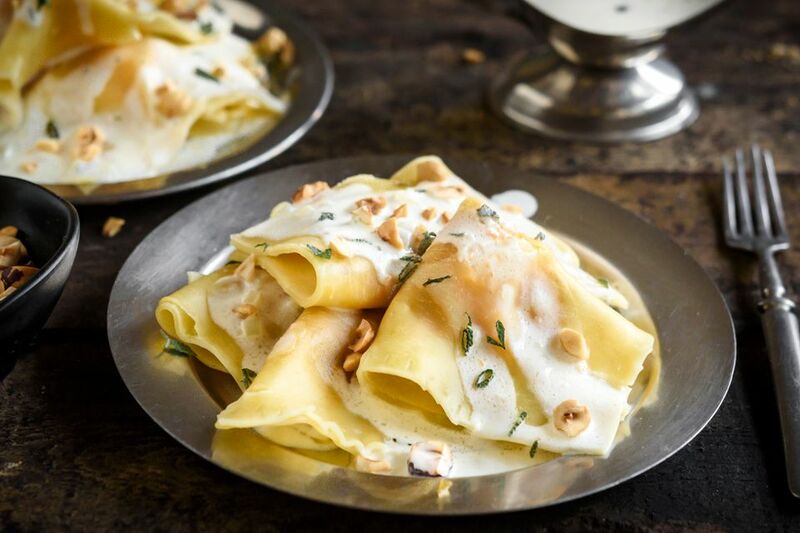 Note: while there are multiple steps to this recipe for butternut squash ravioli with white-wine cream sauce, it is broken down into workable sections to help you better plan for preparation and cooking. Heat oven to 375 F. Spread hazelnuts on a baking sheet and toast in the oven for 15 minutes. Transfer hazelnuts to a kitchen towel and rub briskly to remove the skins. Coarsely chop hazelnuts and set aside. Split butternut squash in half and rub 1 tablespoon olive oil on the flesh and lay cut side down on a baking sheet. Bake 30 to 35 minutes until a fork pierces the flesh easily. Allow it to cool enough to be able to handle it without burning yourself and scoop out the flesh. Purée in a food processor or blender, adding a little water, if needed. Melt 1 tablespoon butter in a large skillet and when foaming subsides, add 3 tablespoons shallot and sauté 1 minute. Add the squash purée and cook on medium heat, stirring frequently, for 2 minutes, until the squash is somewhat dry. Season with 1/4 teaspoon salt and 1/4 teaspoon black pepper. Stir in 3 tablespoons heavy cream and cook for another 2 minutes. Remove from the heat and add 4 tablespoons grated Parmesan and pinch of nutmeg and stir until blended. Allow time for it to cool. Line a baking sheet with wax paper and dust lightly with flour. Lay out 12 wonton wrappers on a clean surface also lined with wax paper and lightly dusted with flour. Lay another wonton wrapper on top of each one. For the white wine cream sauce, melt 1 tablespoon butter in a small saucepan and when the foam subsides, add the shallots and sauté 2 minutes until softened. Add the white wine, cream, chicken broth, and lemon juice and simmer for 10 minutes until reduced by half. Whisk in the cold butter 1 tablespoon at a time. Stir in the minced fresh sage. Bring a large pot of water to a low boil and add the ravioli. Gently stir the ravioli to prevent them from sticking together and simmer 4 minutes. Using a slotted spoon, drain and transfer 4 ravioli to each plate. Drizzle with the white-wine cream sauce and sprinkle toasted hazelnuts on top.